Now in our 30th year of operation, DIVEMASTERS continues to provide professional, capable, and reliable service to the maritime community. 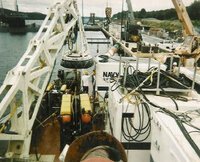 Whether the project at hand requires pin-point anchoring over buried utility crossings, maintaining position while �live boating� divers, or tending manned submersibles or ROVs, Divemasters and the ATLANTIC SURVEYOR are up to the task. The captains and crew are friendly, experienced professionals, dedicated to the successful completion of your mission. We have a broad range of experience interfacing with academic, industrial, research, and military entities, and understand the differing needs and concerns of this diverse community. Our clients know that they can depend on the RELIABLE, PROFESSIONAL, and ECONOMICAL service which Divemasters has consistently provided. The ATLANTIC SURVEYOR is U.S. Coast Guard Inspected and is fully equiped with a complete inventory of the latest safety equipment which is maintained to the highest standards. Safety Drills and Briefings are conducted regularly to assure the safety of our clients, the ship, and its crew. From our base of operations located in Point Pleasant Beach, New Jersey (Mile Marker 1 of the Intra-coastal Waterway) we serve the entire eastern seaboard as well as the Gulf of Mexico. Please consider DIVEMASTERS and the M/V ATLANTIC SURVEYOR when planning your next project. We look forward to the opportunity to be of service.